At the helm of The Flats is Michelin-starred Executive Chef Paul Shoemaker who has worked at Alan Ducasse, French Laundry, Water Grill, Providence, Firefly and Bastide, as well as his own restaurant Savory in Malibu. I first met Chef Shoemaker at the opening of Intro Art Gallery and Chef’s Table in North Hollywood where he offered a multi-sensory interactive dining experience. 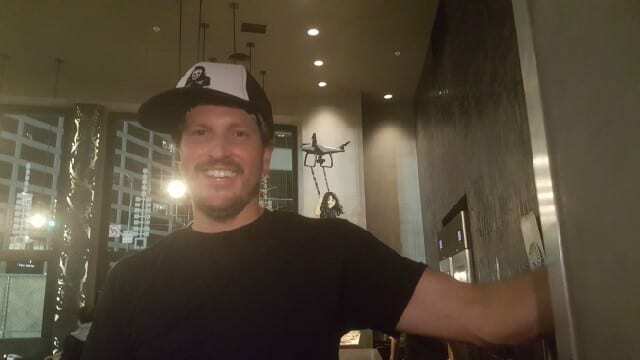 It is hard to forget the edible “dime bag” he served us that was made with Japanese rice paper filled with powdered foie gras, cocoa puffs, pine nuts and carbonated caramel. I was excited to try his newest endeavor, The Flats. Chef Shoemaker has as causal, friendly air about him as he can be found behind the pizza bar in the restaurant. The Flats, named for the artisanal flatbread pizzas on the menu, offers more than pizza. There are salads, meats and other dishes that utilize fresh, seasonal Farmer’s Market produce. And many of the ingredients, such as the pizza dough, bread, infusions, sauces, reductions and house-cured meats, are made in-house. 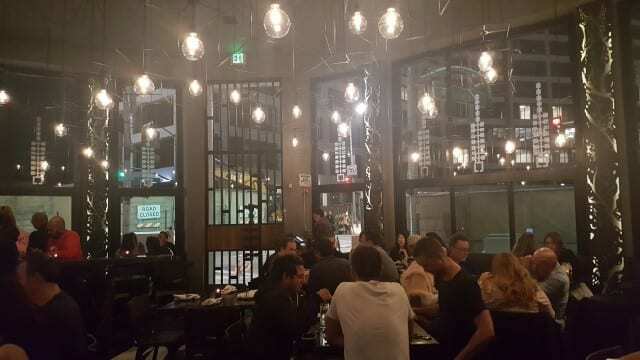 It is a diverse menu that will satisfy many different palates. 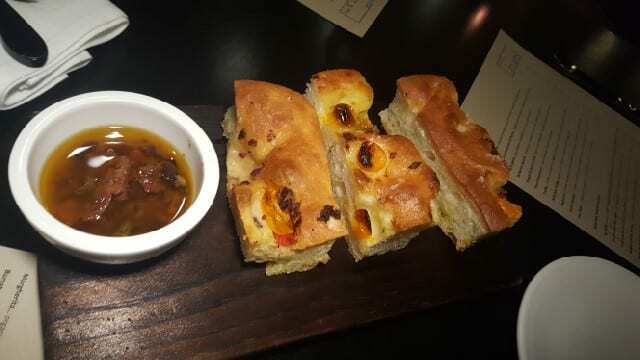 As we sat down and began perusing the drink options, we were served fresh focaccia with olives and tomatoes. Chef surprised us with a Salmon Roe Amuse with crispy salmon skins topped with smoked salmon roe, crème fraiche, Meyer lemon and micro celery. 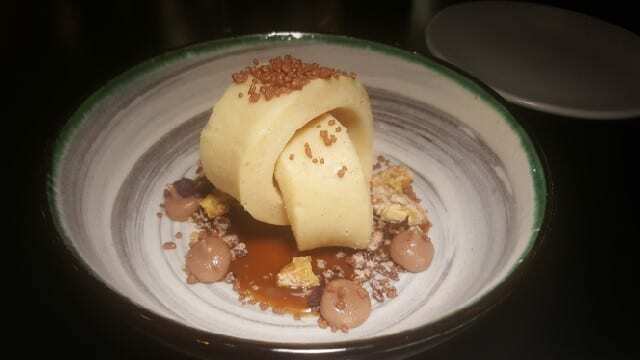 I remembered this tasty bite from the tasting menu at Intro Art Gallery and Chef’s Table. I went with the first drink on the menu called Applejack Cocktail. 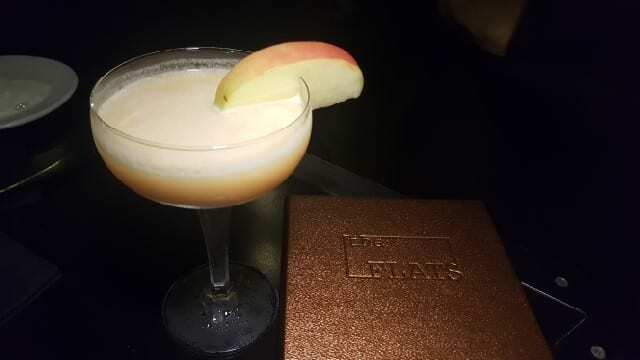 I am a sucker for applejack brandy and this drink was made with applejack, brown butter syrup, lemon, house apple cider and cinnamon. Looking at the menu, we were drawn in by all of the appetizers and salads and decided to order a number of them to share. 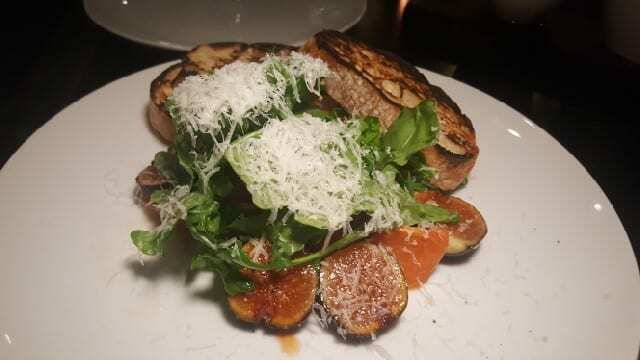 As a fig lover, the Fig Salad was a must. Halved figs are served with wild rocket, smoked proscuitto, burrata, pickled persimmons and pine nuts with toasted ciabatta. A favorite dish of the night was the Crispy Hen of Woods Mushrooms. 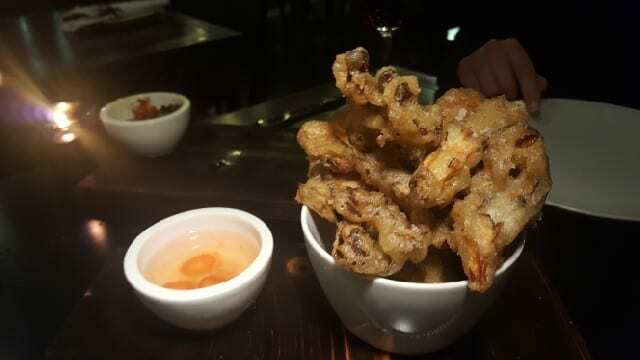 Large Hen of Woods mushrooms are battered in a crispy tempura and served with garlic water. They are not the least bit oily or greasy and the batter, which adds a nice crunch, does not overwhelm the mushroom flavor. 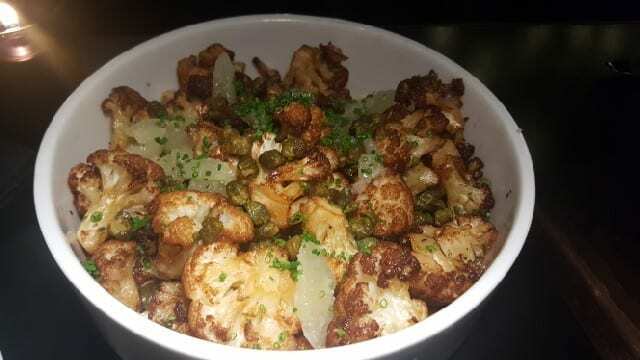 The Roasted Cauliflower is served with caperberries, dates and Meyer lemon adding a sweetness and a tartness to the cauliflower. 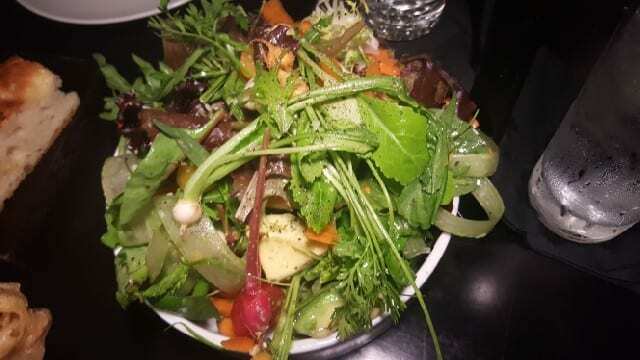 The Field Greens Salad is a simple salad but it is so flavorful. Shaved baby vegetables, cherry tomatoes and avocado are served with lemon, olive oil, sea salt. 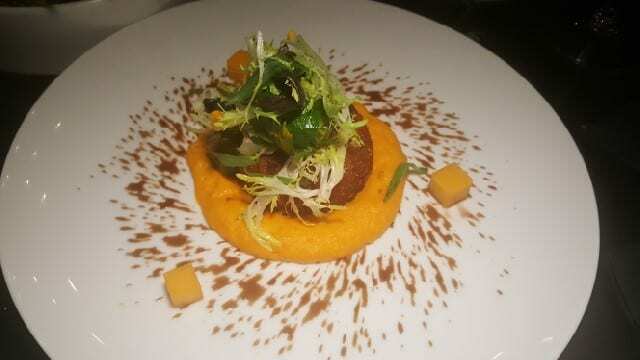 I was intrigued by the Dungeness Crab Cake as it is served with pumpkin, currants, and cocoa ginger reduction. It is a lot of flavor in one dish. Of course we had to have flatbreads at The Flats so we selected two from the menu. 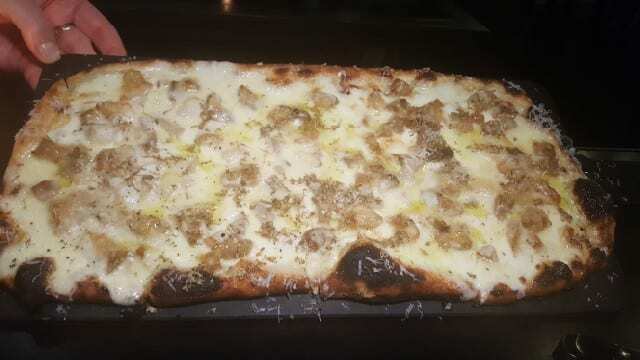 The Porcini Mushroom Flatbread is made with sauce mornay, gruyere and rosemary. It is a rich-tasting flatbread so I could only manage two slices but so so good. 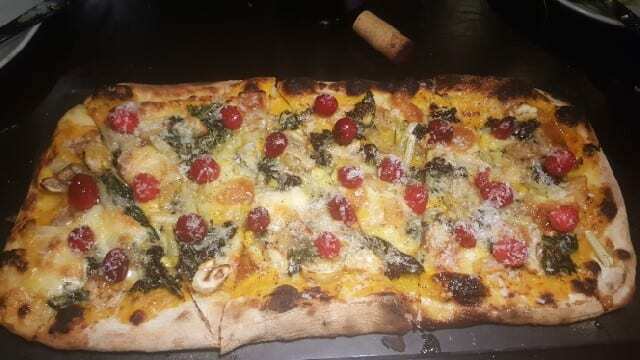 The Butternut Squash Flatbread with chestnuts, cranberry, kale, pork belly and gruyere is also rather intense in flavor. I liked the sweetness of the butternut squash but found the whole cranberries, which kept rolling off, to be a little bit too much. 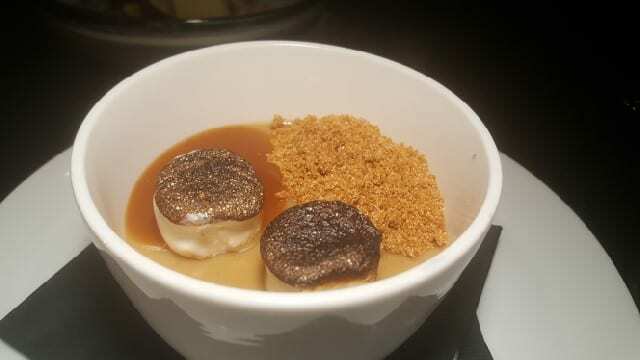 Pastry Chef Raymond Morales has created the dessert menu and we indulged in three desserts as we were there to celebrate my friend’s birthday. Butterscotch Marshmallows – The creamy butterscotch pudding with toasted marshmallows on top was by far my favorite! 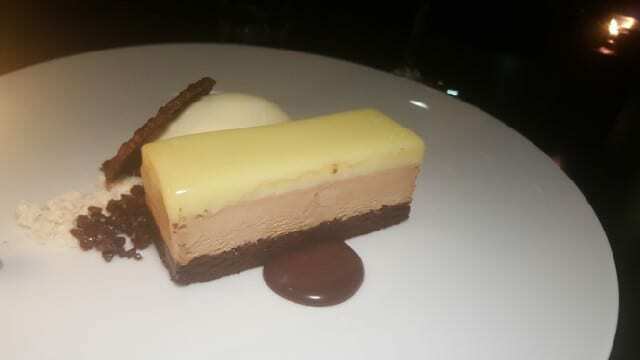 Brown Butter Ganache – We loved the artistic presentation of the brown butter ganache and did not want to destroy it. It is not an overly sweet dessert but it is definitely a rich dessert. Barrel Aged Chocolate – This was another hit with varying types of chocolate. Do not let the construction on Wilshire Blvd. deter you from visiting The Flats. 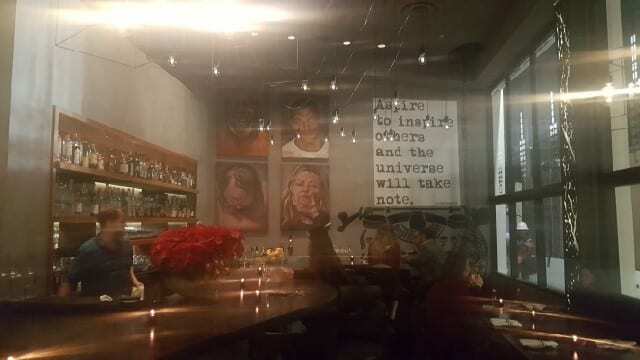 On the back wall by the bar there is a typewriter mural by WRDSMTH. On a piece of paper coming out of the typewriter it says, “Aspire to inspire others and the universe will take note.” Take note of The Flats. Lunch is available Monday through Friday and Dinner is seven-days-per-week. This entry was posted in Cocktails, Food and tagged Beverly Hills, Chef Paul Shoemaker, Cocktails, flatbread, food, Los Angeles restaurants, The Flats by Allison Levine.